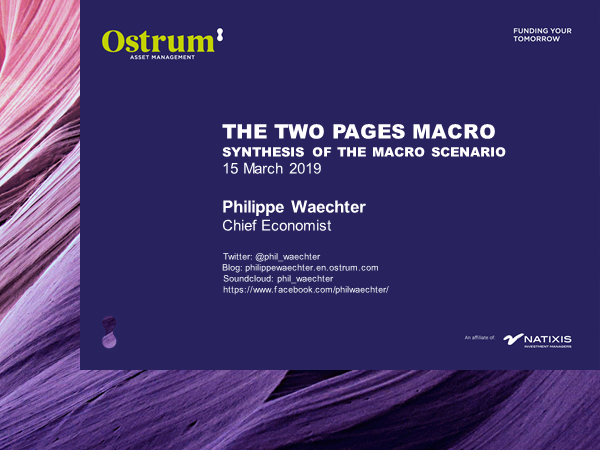 The Macro 2 pager explains how the interest rates profile will remain low for an extended time. The central banks’ stimulus after the 2008 crisis has been caught up by an economy whose characteristics have changed and which can now accommodate only low rates thus conditioning the behavior of central banks. The modest rebound in the IFO index in March is sometimes interpreted as the counterpoint to the drop of the Markit index released last Friday. There is indeed an opposition in March between the pace of the two indicators. One goes up again while the other is down. However, what shocked in the Markit survey is the sharp downturn in the manufacturing sector, while the services sector was doing quite well. The manufacturing index was 44.7 against 47.6 in February. It contracts for the third month in a row. In contrast, the composite services indicator (calculated as the non-manufacturing ISM) is stable in March at 53.7 as in February. The culprit is the manufacturing index. Yet when comparing the manufacturing index of Markit and that of the IFO we have exactly the same profile. The peak of the two indices is almost the same and the break observed since the beginning of 2018 is similar. The shock on the German economy reflects the rapid slowdown in the world trade momentum. The impact on the German economy is through the manufacturing sector whether measured by IFO or Markit. The pace of service between the two measures is not the same and this is what differentiates synthetic indicators from the two surveys. But services are more reflective of the domestic market than the sensitivity of the German economy to world trade via the manufacturing sector. The external shock is strong and brutal in Germany and it has first to be stabilized before the beginning of a recovery. It will take time and this justifies the pessimistic forecasts for Germany. Look at this map. Who then can expect a trade deal between China and the USl The real question is about techno leadership? Huawei has a step ahead of the US. The Chinese company already has deep discussions with many countries throughout the world. From Asia to Europe, Africa and Latin America the Chinese web is already impressive. On the other side, the US has forbidden purchases of infrastructures coming from Huawei. Australia, New Zélande, Japan and Taiwan follow the same rule. But it is a minority. Recently, the US has generate pressure on Germany to forbid the German to buy Huawei products in the renewal of their mobile network. Germany has not changed its mind and has allowed Huawei to compete. The balance of strength at the global level may change rapidly at the expense of the US. How to expect an agreement that would validate the dominance of one over the other? From China to the US?